To successfully identify flying insects, try a little detective work. Some flying insects come from 10 miles away or more, depending upon how the wind is blowing. Others breed on the exterior of a property, and still others breed indoors in dry pet food, plugged drains, or on rotting potatoes and fruit. Therefore, seeking out the source to eliminate the breeding area can be complicated, particularly if the breeding area is not on the property you’re servicing. Moths flying to bright lights on a TV screen are not clothes moths (Tineola bisselliella). 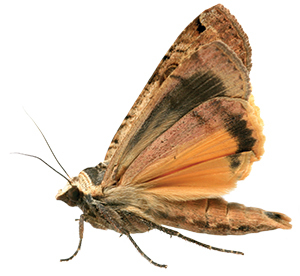 Clothes moths tend to stay in dark and semi-dark areas, and are weak flyers. Gypsy moths (Lymantria dispar dispar) can enter through an open door or window to deposit their eggs and die. The eggs hatch and numerous small caterpillars can be found crawling on the walls and ceiling. Attracted to lights at night. Aquatic flying insects, moths, etc. Attracted to odors emitting from the structure. Cooking odors, dead animal odors, etc. Attracted by shade. Such as blowflies resting under a weeping willow. Attracted by location. Cluster flies at the top of a hill, for example. Attracted by poor sanitation. A characteristic of American cockroaches in infested palm trees. Attracted by pheromones left from insects overwintering the previous year. Multicolored Asian lady beetles, for example. Attracted by flowering plants. Bees and other pollinators. Attracted by pets and pet food kept outdoors. Attracted by standing water for egg deposition (mosquitoes) or swimming pools and hummingbird feeders (honeybees). Attracted by structural elements. Window shutters and cedar shake roof tiles attracting Mediterranean paper wasps are examples of this. Attracted to the terrain. Digger bees in a golf course sand trap, for example. A multi-pronged approach worked at a tough stable fly (Stomoxys calcitrans) account. Once it’s determined what attracted the pest, a decision can be made about the next step. Cutting down all the flowering shrubs and flowers, relocating the house or changing all of the roof shingles is neither economical nor practical. However, pest-proofing a reasonable area and/or changing a small amount of terrain are feasible. Before starting service, stand back and watch whether any flying insect activity is noted. It’s much more prevalent on sunny days than on rainy and cloudy days. Remove hollow wind chimes on a structure’s exterior. They may be home to paper wasps. Pointing out a conducive condition like this adds value to your service. 1) Dark fungus gnats (Sciaridae) were annoying workers in an office building. The tenants were so frustrated that they refused to pay rent. An inspection of all the potted plants revealed zero fungus gnats. Leaks in the suspended ceiling were not the culprit either. After an hour of inspection, including the exterior roof and near a window air-conditioning unit, which was dripping condensation onto the soil outside, the problem was solved. But it wasn’t the wet soil. It was a paper bag inside a secretary’s desk, which housed an open coffee can of recycled coffee grounds. She was saving them to bring home to use as organic soil for her small garden. Removing the coffee grounds and using an insect light trap (ILT) for 24 hours resolved the situation. 2) The nose of a Saint Bernard who was kept outside was raw and bleeding due to stable flies. The white aluminum siding of the dog owner’s home was dotted with thousands of black specks that turned red when wet. Stable flies feeding on the dog and defecating on the siding created the raw nose and dark spills. An inspection of the premises revealed grass clippings at the back of the property where the stable flies were breeding. The neighbors on both sides also were storing their grass clippings the same way. Removal of the old grass drastically reduced the stable fly population. The dog was taken to the veterinarian and properly treated. 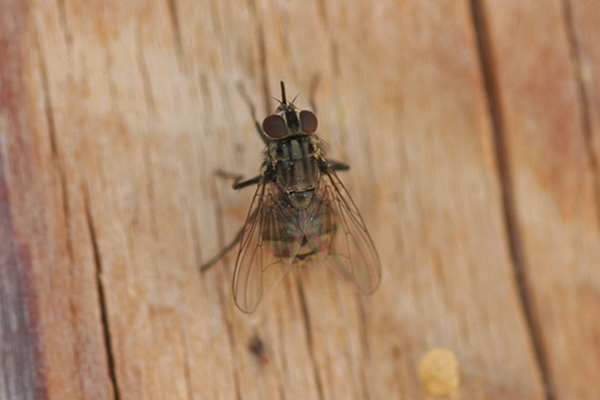 The flies were not completely eliminated, however, as new flies can spot breeding material from over a mile away. Select targeting of pesticides where the flies were most likely to breed also helped minimize the chance of them attacking the dog. Dr. Frishman, a PMP Hall of Famer, can be reached at PMPEditor@northcoastmedia.net.